2. 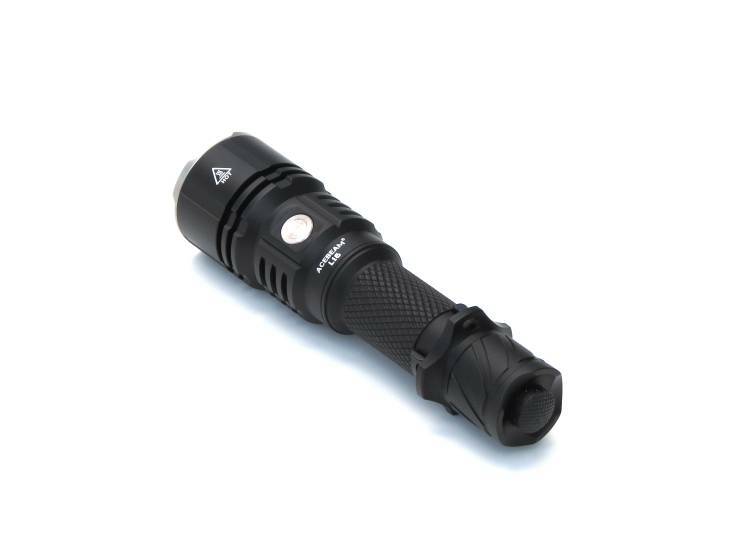 A flashlight with narrow and far reaching beam, less lumens and powered by a tiny XP-L HI or an equal emitter. 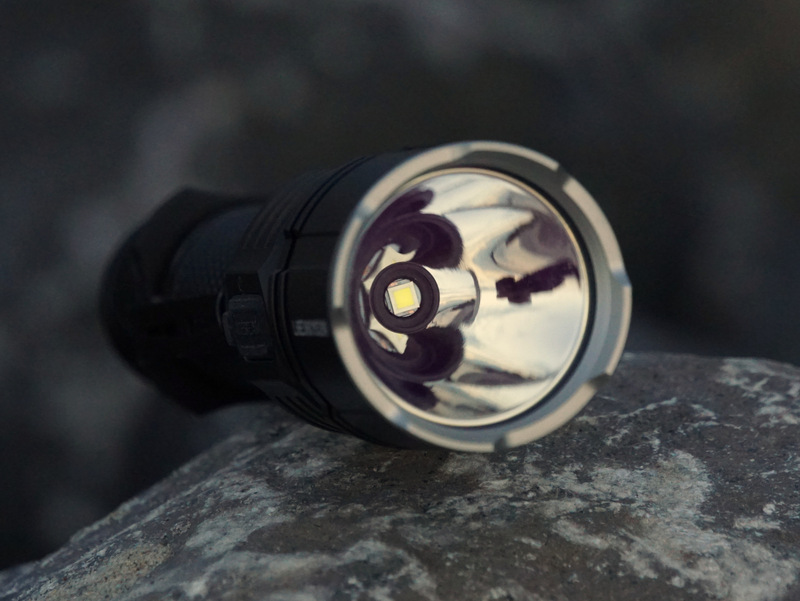 But the next generation LEDS like XHP35 HI can give both lumens and throw; this is good news for those who look for a tactical light and want more overall power. 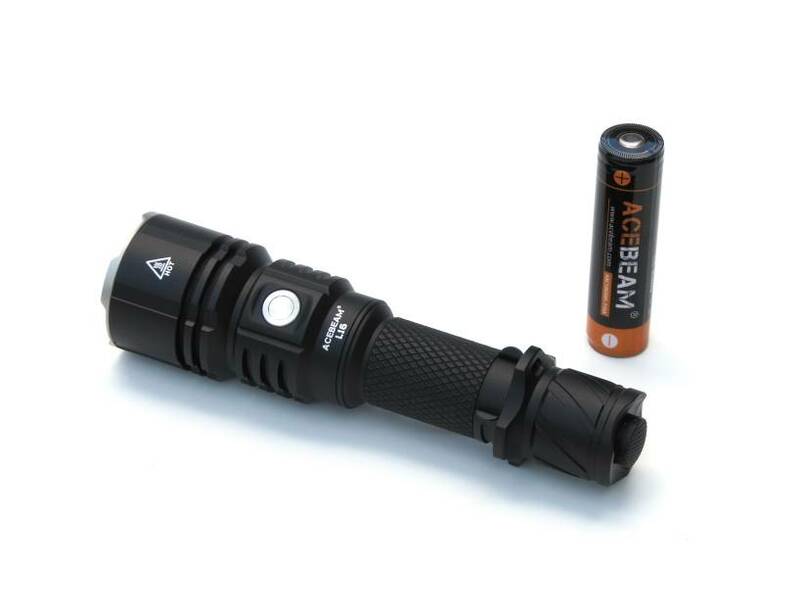 The new Acebeam L16 is a rechargeable flashlight that is equipped by a bulb of the latest generation. 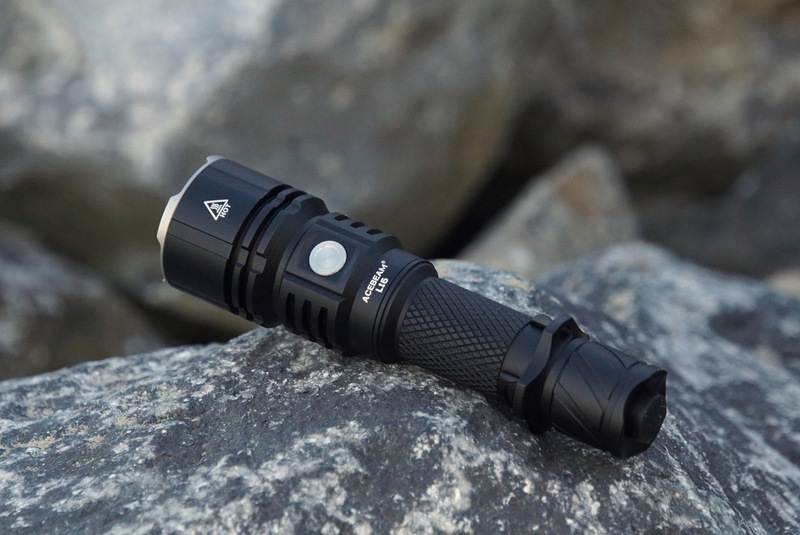 In this review I’ll show you the details of this light, share my opinion about it, and will show you have the XHP35 HI performs against XPL-HI. 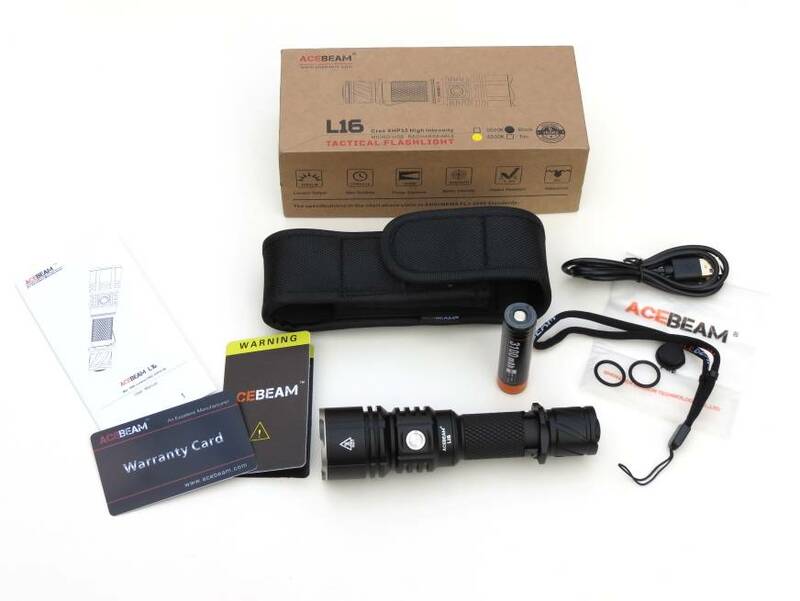 Special thanks here to Acebeam.de that sells the Acebeam-collection and shipped the light to me. 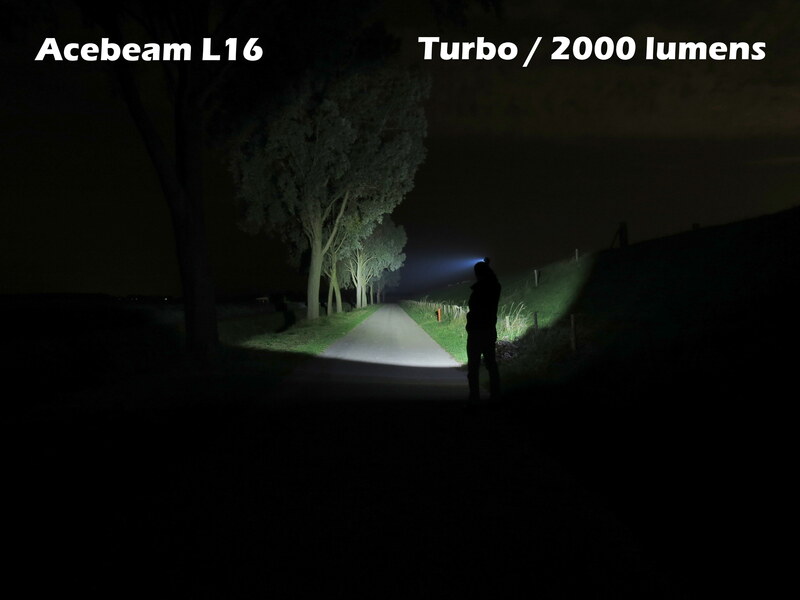 Let’s have a look at the Acebeam L16! • Max beam distance: 603 meters. • Impact resistant under water: 1.2 meters. • Aircraft grade aluminum body structure. • Premium type III hard anodized anti-abrasive finish. • Ultra-clear tempered glass lens with anti-reflective coating. 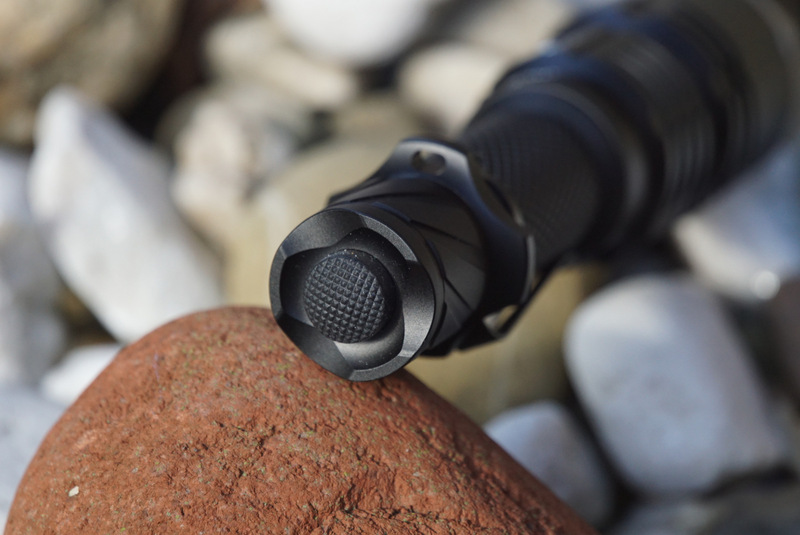 • Tactical knurling for firm grip. 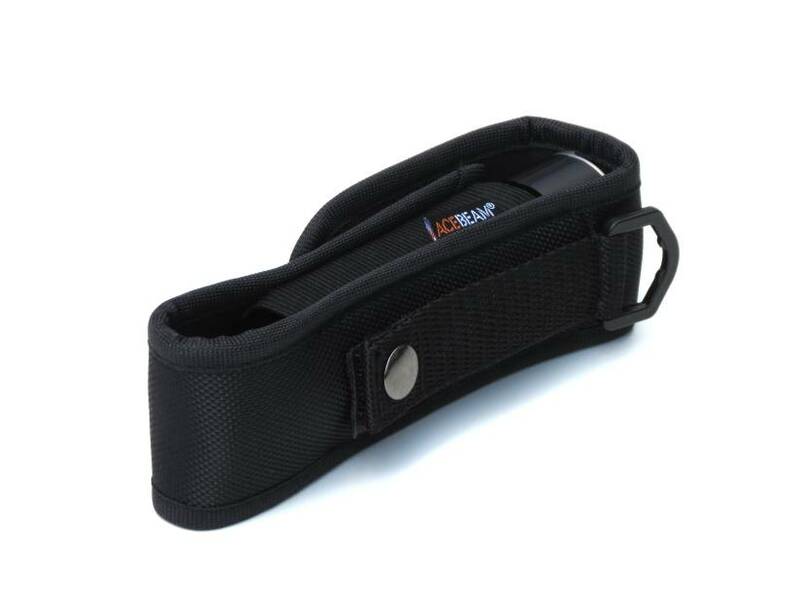 •Specially designed for military, Law Enforcement, Self-defense, Hunting ,Search & Rescue and Outdoor activities. 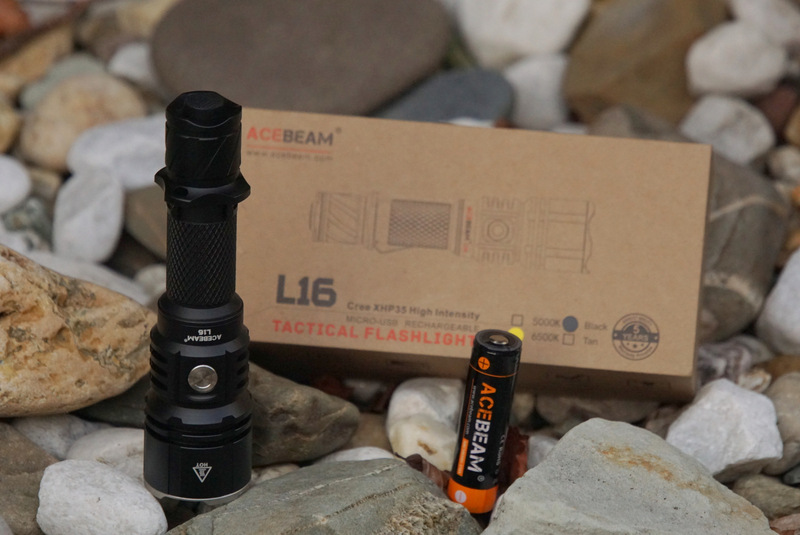 The Acebeam L16 is easily recognizable as a tactical light. 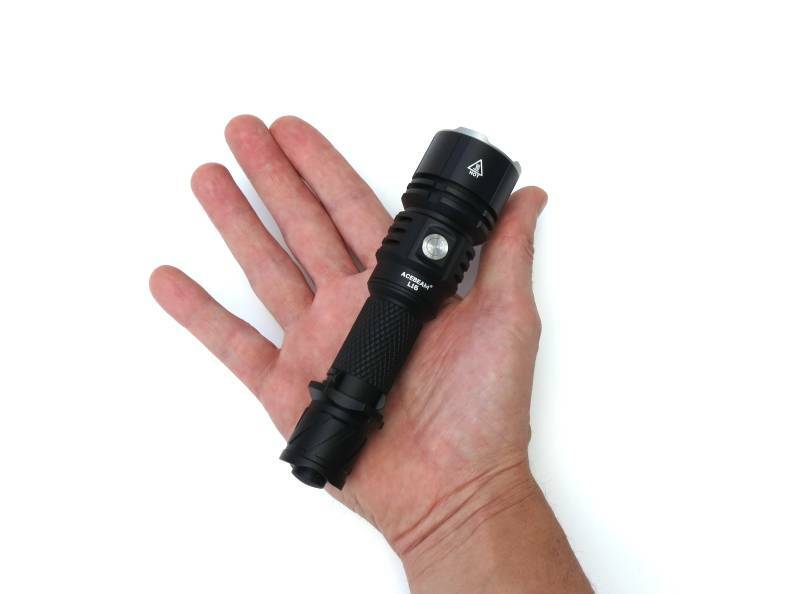 It’s not the smallest in its class, let's say a mid-sized single 18650-flashlight. The L16 comes in matte-black color with light-grey bezel and some silver accents. 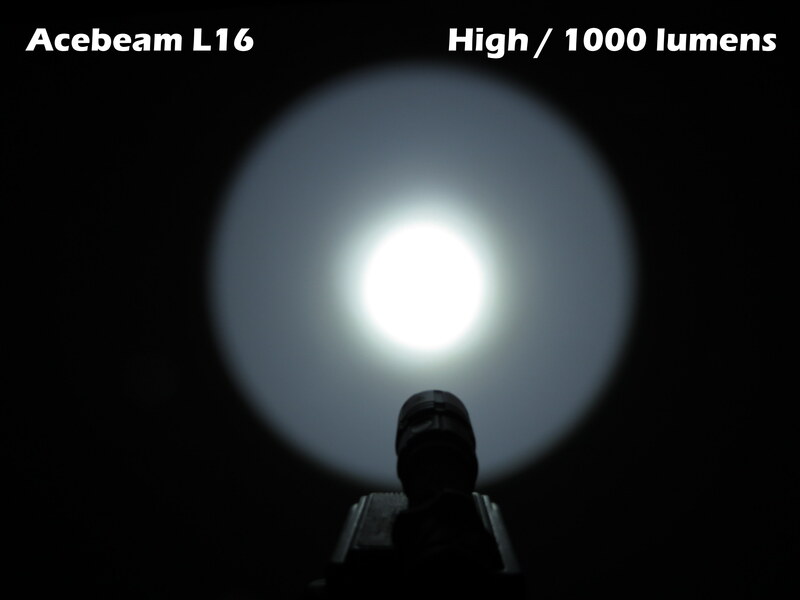 Like other Acebeam-lights I earlier tried out, this L16 is a good-looking light. It’s little heavy, but feels like a high-quality product. The anodizing is done well, I couldn’t detect defects on this. Even the engraving is clear and well-aligned. The light has a big and long head in relation to the tube. This is due to the deep reflector, but also to avoid that this compact light will be overheated very soon. 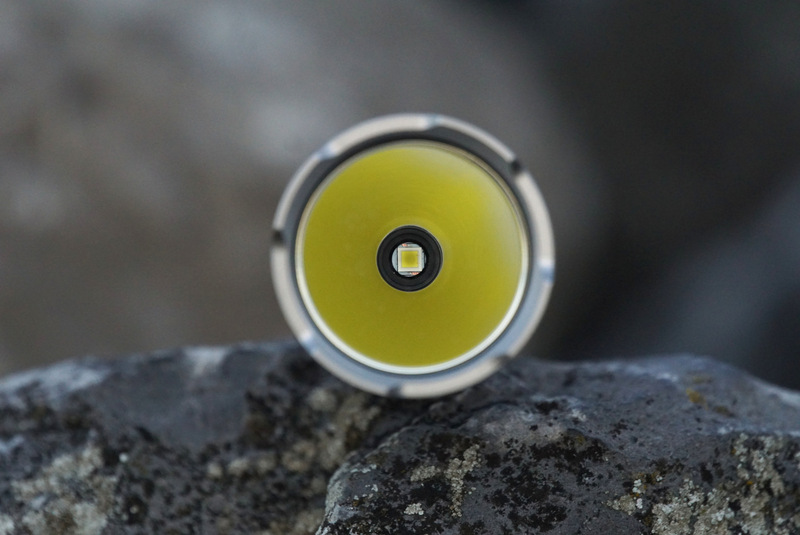 The anti-rolling design is excellent, also thanks to the tactical ring this light will not roll of the table. 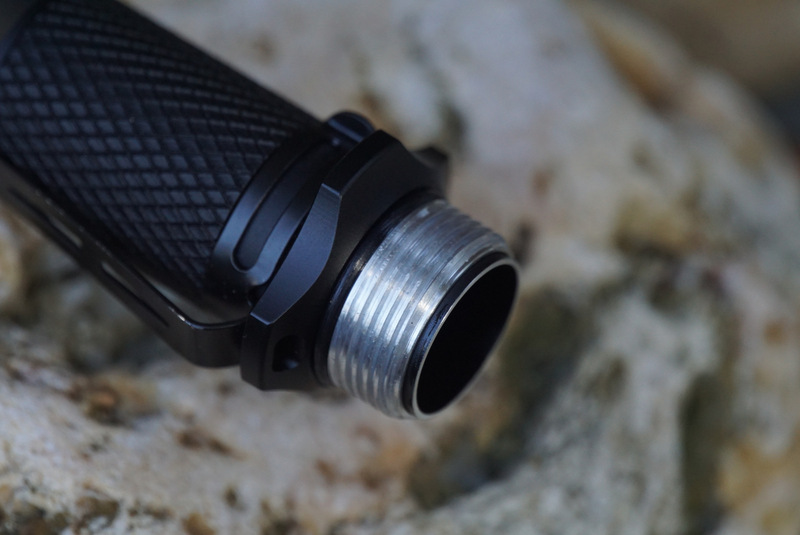 At the head, that has deep fins for good cooling, we see also the silver power button and the USB-charging port. 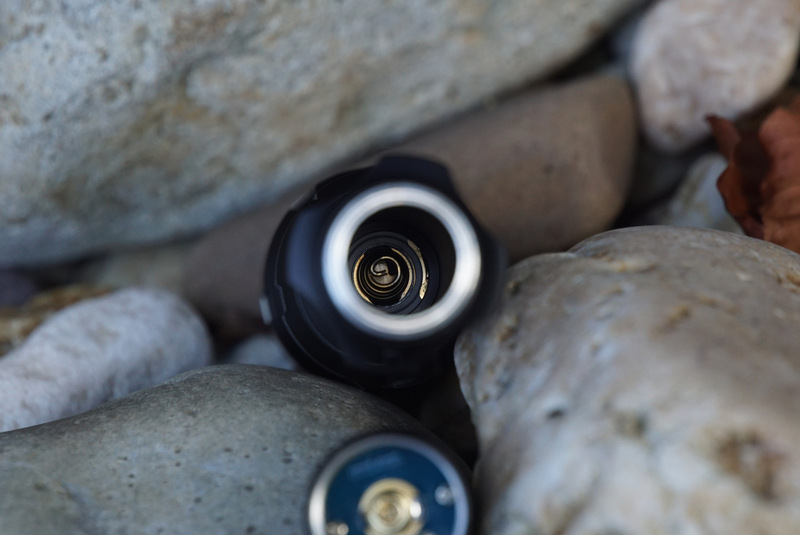 The micro-USB port is protected by rubber cover that shuts it up well: A “popping” sound can be heard when you discover the port. Next to the port we see a tiny indicator, that’s meant to inform you about the lights’ status when it will be charged. The body has a fine-grained pineapple texture that gives very good grip. The big clip, that is one of the strongest I met before, showed some defects at the anodizing. The tail-cap has its own looks and style, which I really like. 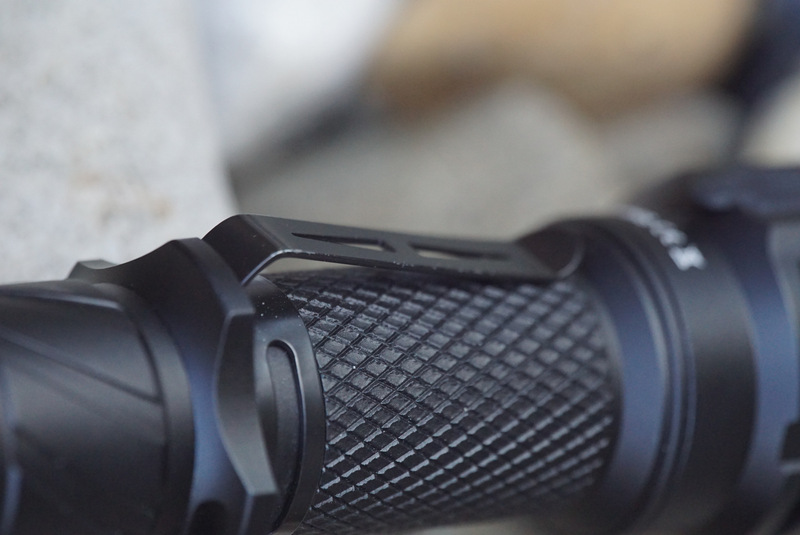 Like most tactical torches, the L16 can’t tailstand. When we open the light (both head and cap can be removed), the threads run smooth and were slightly greased. 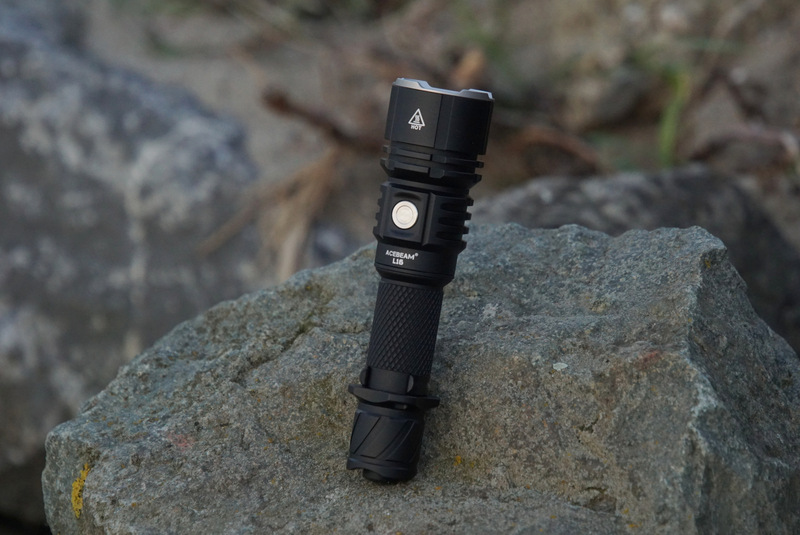 On the other hand, a rechargeable flashlight doesn’t need to be opened several times a week. But inside the head, tube and cap it looks well-finished: Gold-plated springs, no sharp parts, neither glue or solder rests. 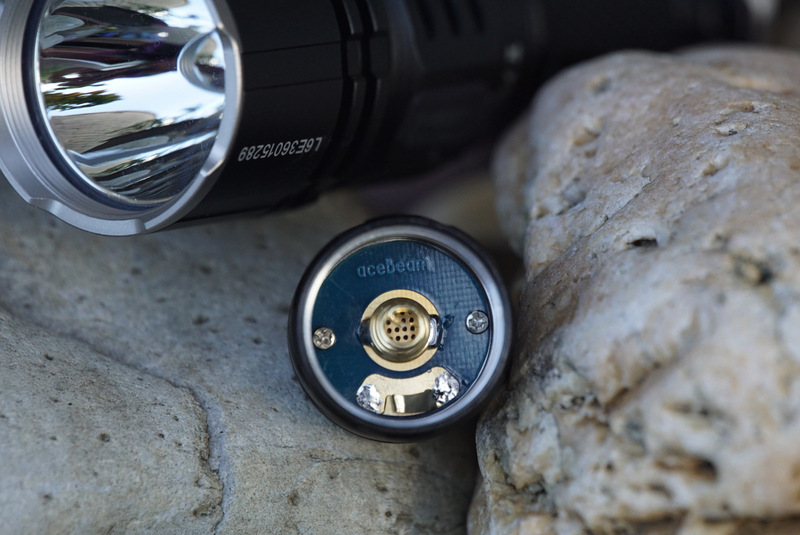 In the light we find a Acebeam-branded IMR-cell with button top. Looking into the head we see a clean and coated lens, and a deep, smooth, and defect-free reflector. The flat XHP35 HI LED wasn’t perfectly centered at my testing-light; but I did not see anything about this back in the profile. So, no big issue here, but it could be done better. 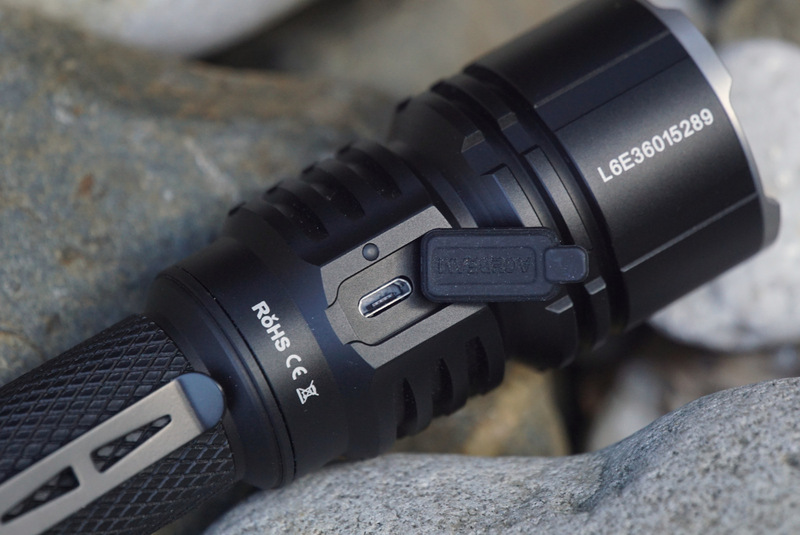 My overall impression about the L16 is a good one: A well constructed and finished tactical light with nice appearance. 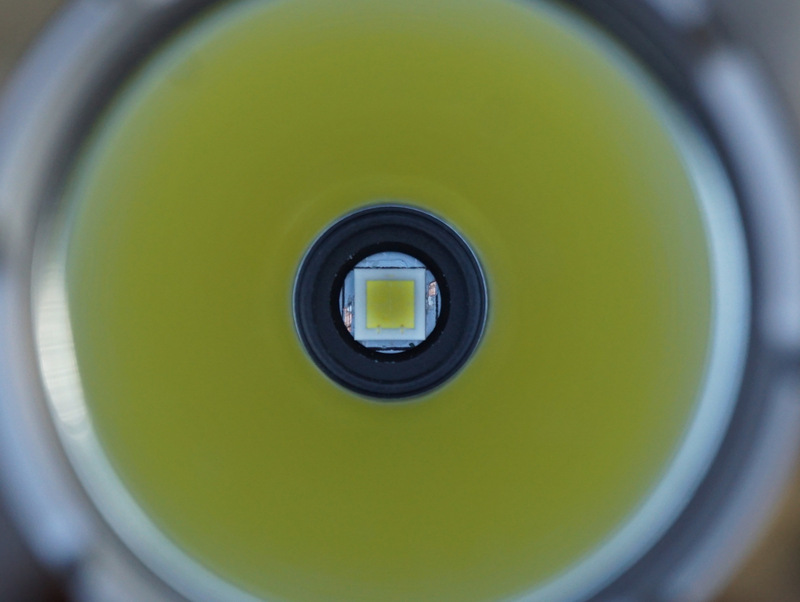 Please scroll down to watch a couple of pictures that will show you more detail about the light! a gold-plated plug; nice detail! 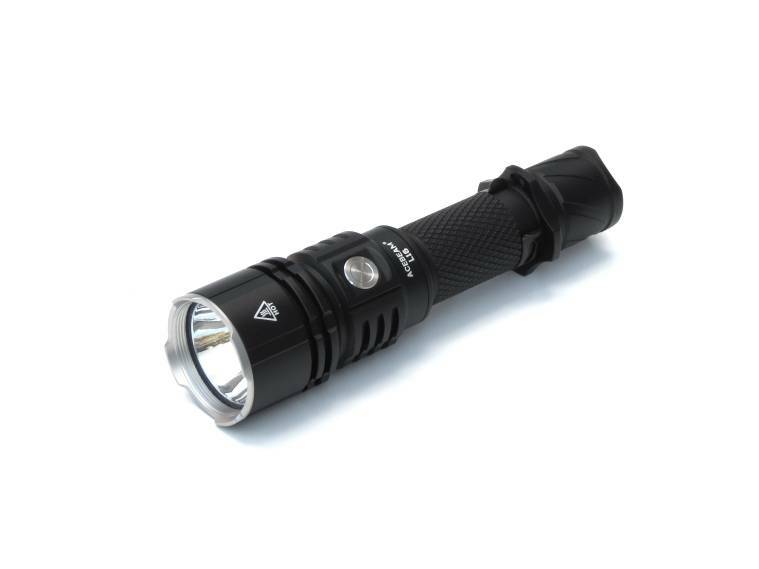 As said earlier, the L16 is a medium-sized single 18650-torch. I can be carried for longer periods in your pants pocket or jacket without problems. If it's too big for your pocket, the strong clip will hold it in its place when you attach it to your clothes, cap or anything like that. 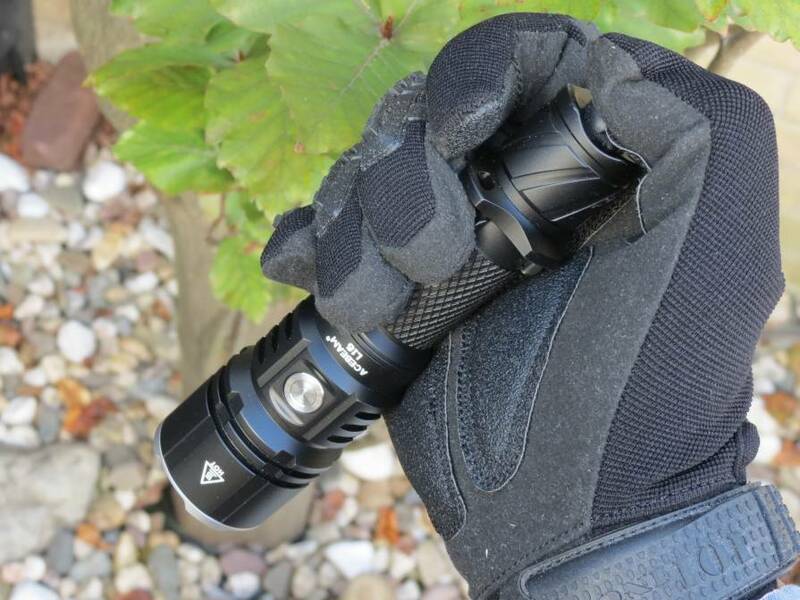 What I like about this tactical light is the excellent grip: Although this light is slightly bigger, it’s almost impossible to lose it thanks to the excellent grip, even with gloves. 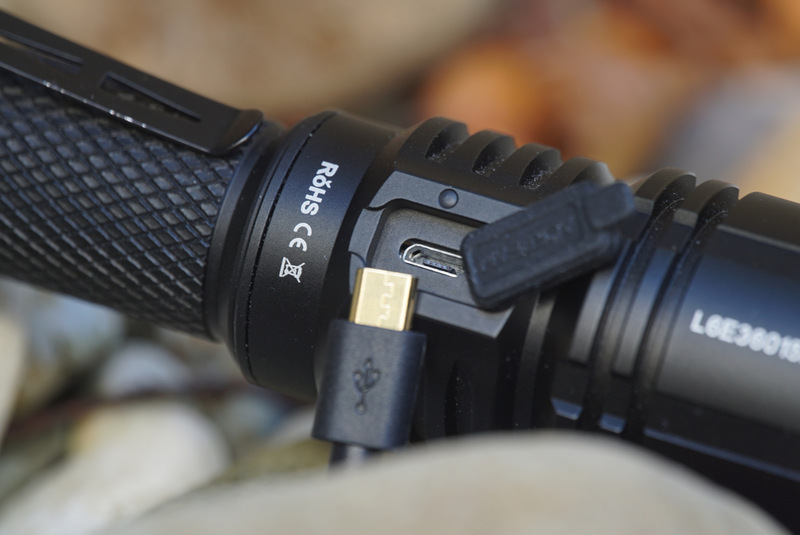 Charging is easy and rather quickly done; simply plug in the micro-USB plug to the connector and wait until the indicator (that’s better visible than the indicator on the EC50 GEN II) lights up in green color. 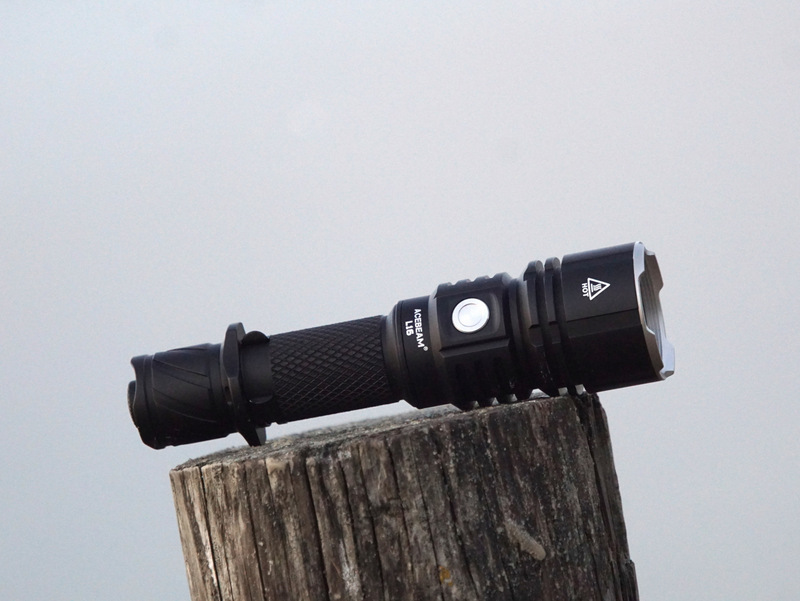 Works well, and I regularly use a light with rechargeable option to charge my other (spare) 18650’s. 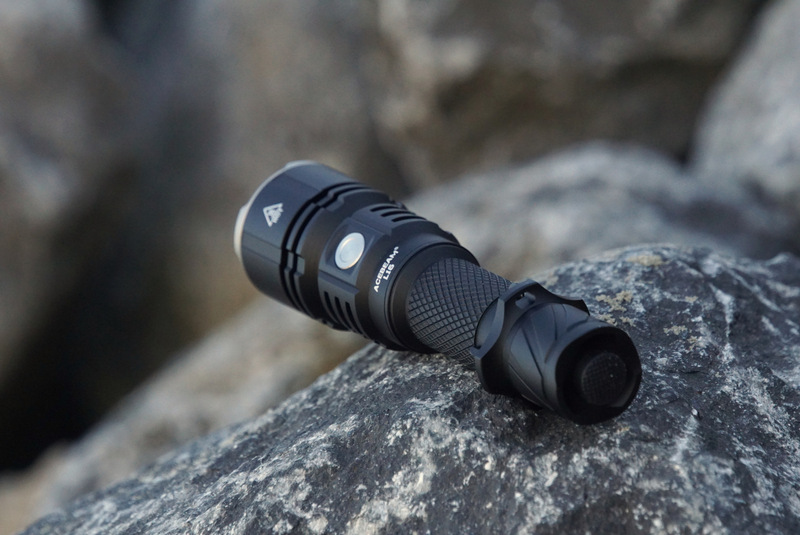 Keep in mind that the L16 won’t reach 2000 lumens output if you use a standard 18650-cell, according to the manual, you should have maximum 1400 lumens using a standard 18650. 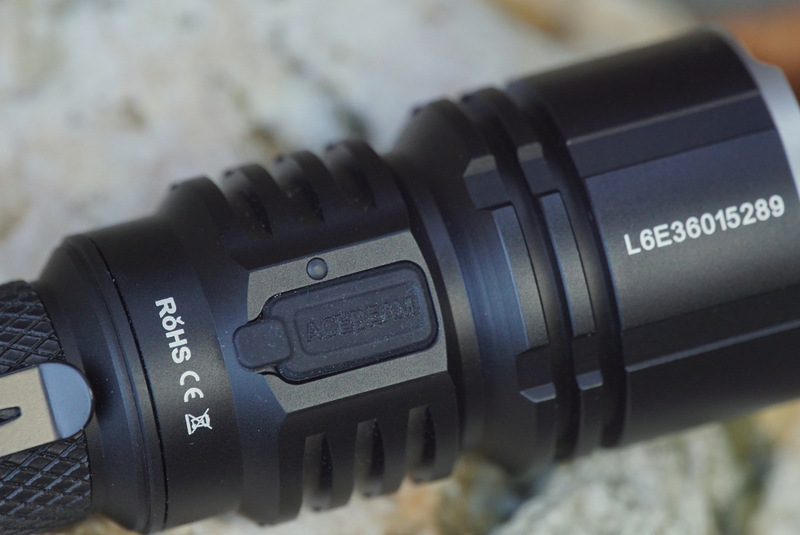 The L16 has two buttons, one on the back for tactical use, and one at the head for daily use. 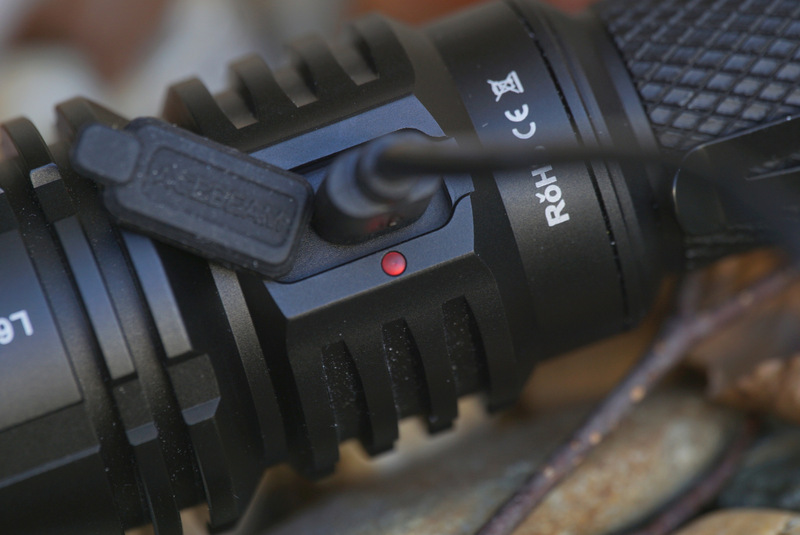 A single click on the side-switch will turn the L16 on and off. The light will start in last used mode. Press and hold (when on) to cycle through the five output modes. Works fine to me, I like these “direct” interfaces, you don’t have to get used by it. 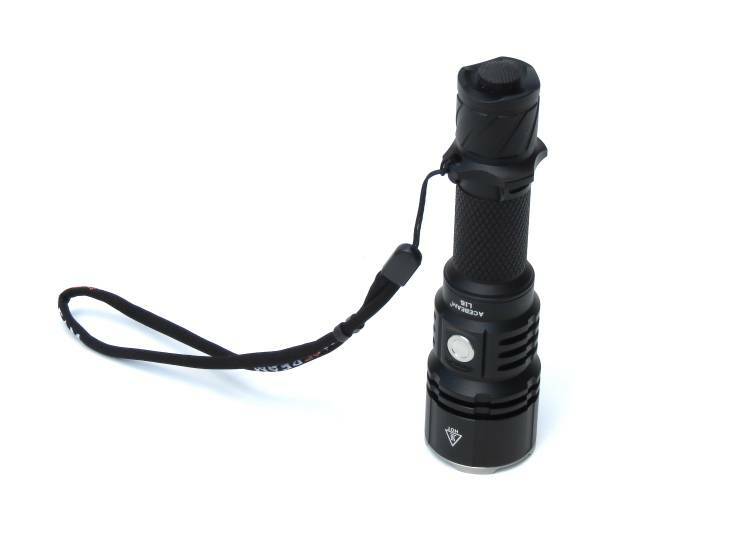 Three direct modes here from off when you use the side-switch: Press and hold from off to go to direct firefly; A quick double press gives instant-turbo and three clicks turns on the L16 in Strobe (one frequency). 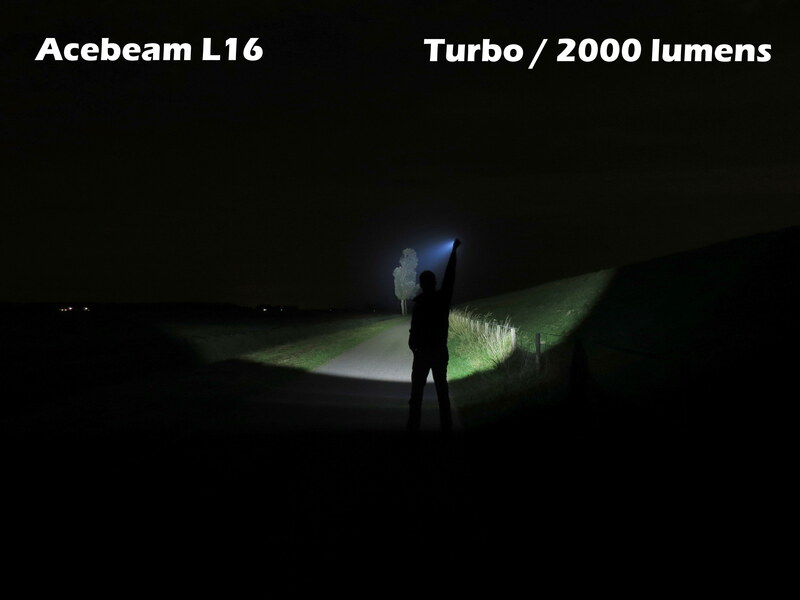 Instant turbo and strobe works also at the same way with the light turned on. To me, strobe is too far away because you need three clicks, but I can work with this interface, I like it. Using the tail switch you have only two options: Momentary-turbo and constant turbo. You can use the tail-switch also when you turned on by using the side-button. Only thing is here that you can’t return to last used “daily-mode”: after using the back-switch for momentary or constant you have one option after it: turning the light off. The lock-out mode the L16 uses is one that I haven’t seen before: It only locks the side-switch, the clicky at the tail can still be used. It must be activated by pressing and holding the side button for longer than three seconds. 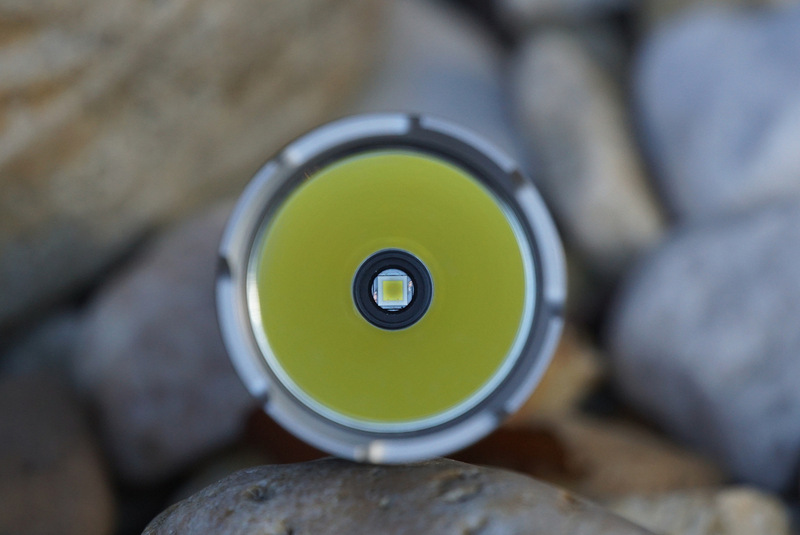 A quick triple-flash notifies you that the side-button is locked; use the same steps to unlock the L16. Not the worst solution, in my eyes a good one! Option two is releasing the lights’ head (not the cap); at that way the L16 is completely locked-out. I couldn’t find anything in the manual or the light about low voltage-warning. 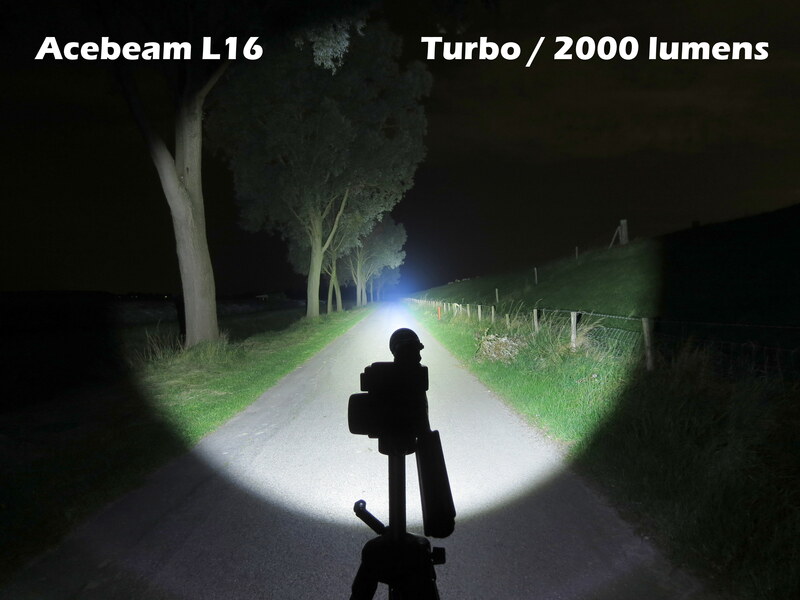 Neither I couldn’t find details about the overheating-protection; but I can tell you that thanks to the big head the light can be used for minutes in turbo without decreasing output. 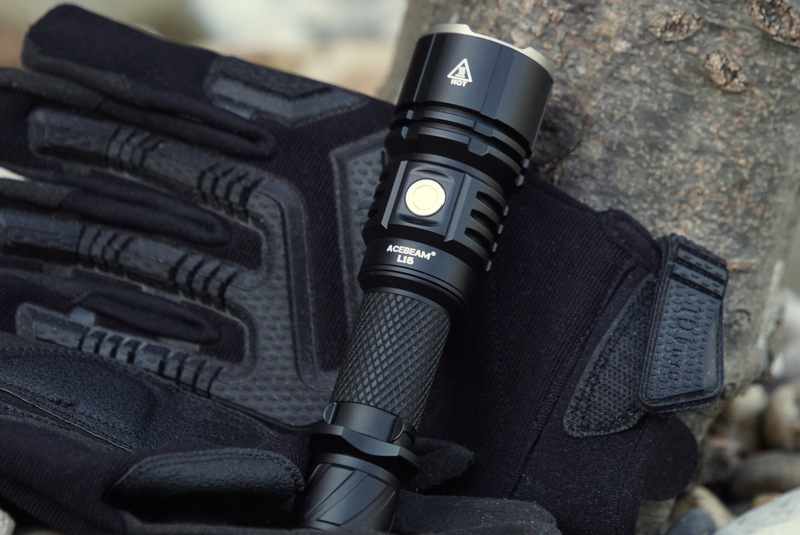 Overall, this is a very good interface, especially to a tactical light. Daily modes all controlled by the side-button, tactical mode by the clicky. 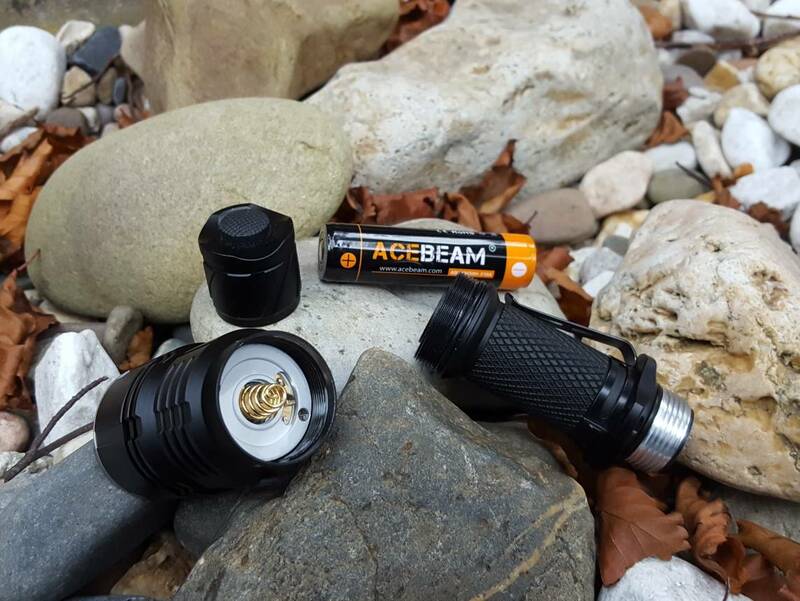 To me, Acebeam doesn’t have to change anything about it. Five normal output-modes here, in order of: FIREFLY > LOW > MEDIUM > HIGH > TURBO. 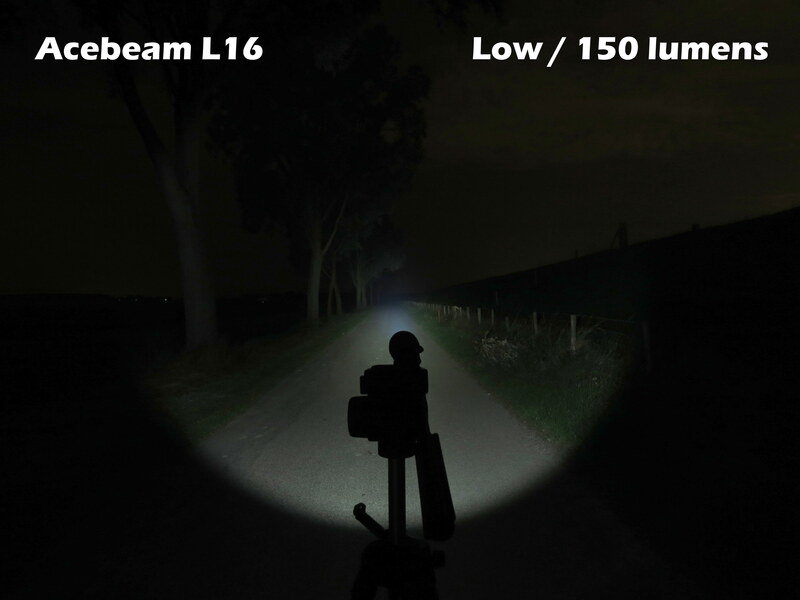 Good to have a real low on this light, it gives long runtimes and make the L16 an all-rounder. 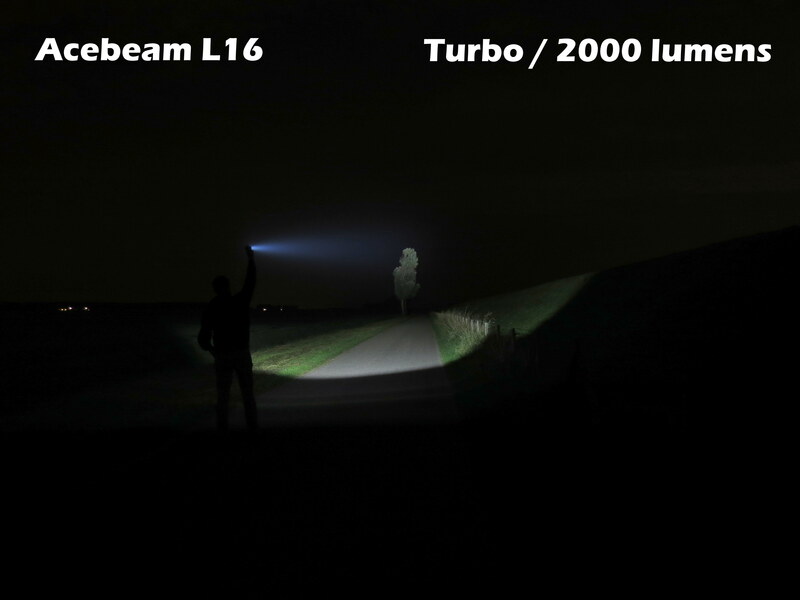 But next step is a rather big one, from 1 to 150 lumens. For the rest the spacing is good, mostly you get double output by the next step. 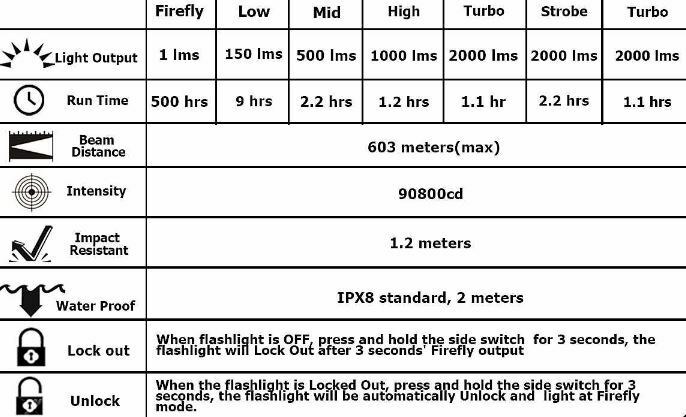 Two instant modes here: direct-FIREFLY and direct-TURBO. One special mode on the L16: STROBE. This is a direct mode, that can be activated both from off and on. 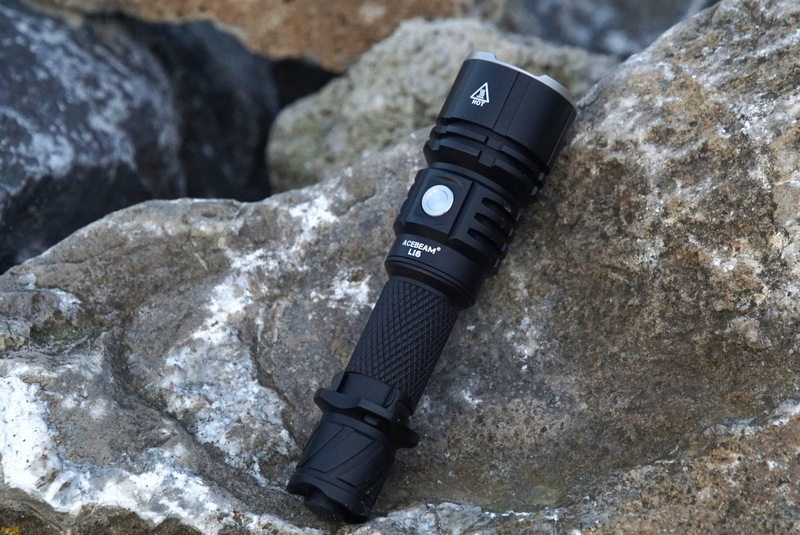 No beacon of SOS here, only the mode you need at most on a tactical torch. Two ways to LOCK-OUT the L16, but nothing on this light about LOW-VOLTAGE. 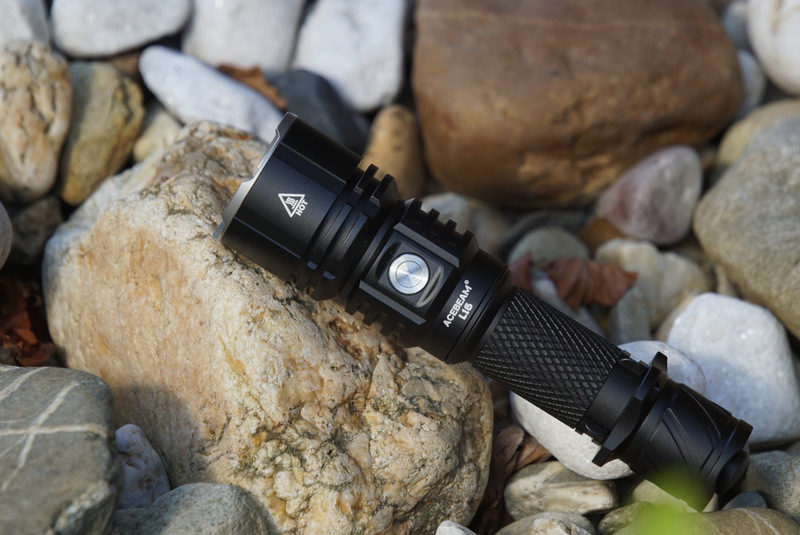 Not the most complete light in its class, but the modes that are most important are there. What you can see in this profile is that the XHP35 HI has good throw but also a big beam. I saw this earlier at the Manker U21 too, the L16 produces a thick light-saber. The profile shows a narrow up to medium hotspot and a medium, but not an intensive corona that gradually overflows into the spill. This makes the L16 an impressive thrower with a rather big beam. 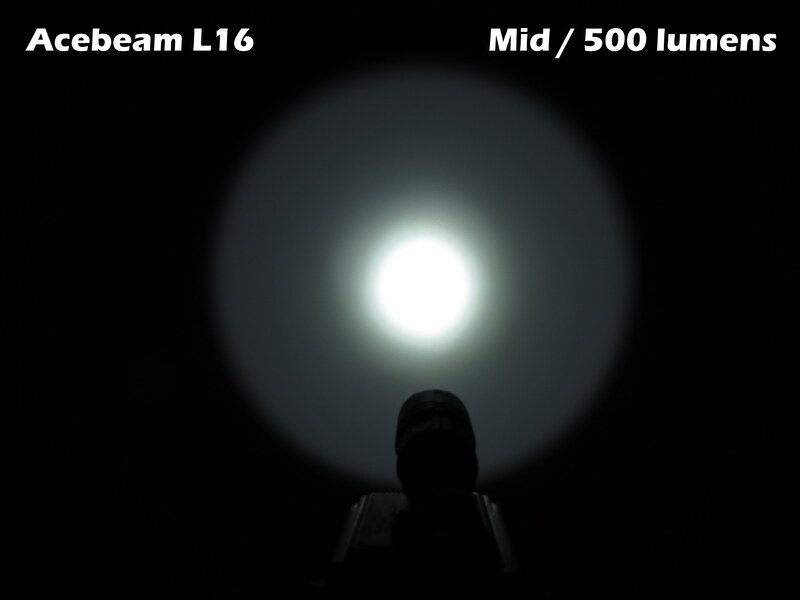 Take a look at the beamshots chapter to see how it looks in the dark. No PWM detected at any output-mode, I’m really happy with that. 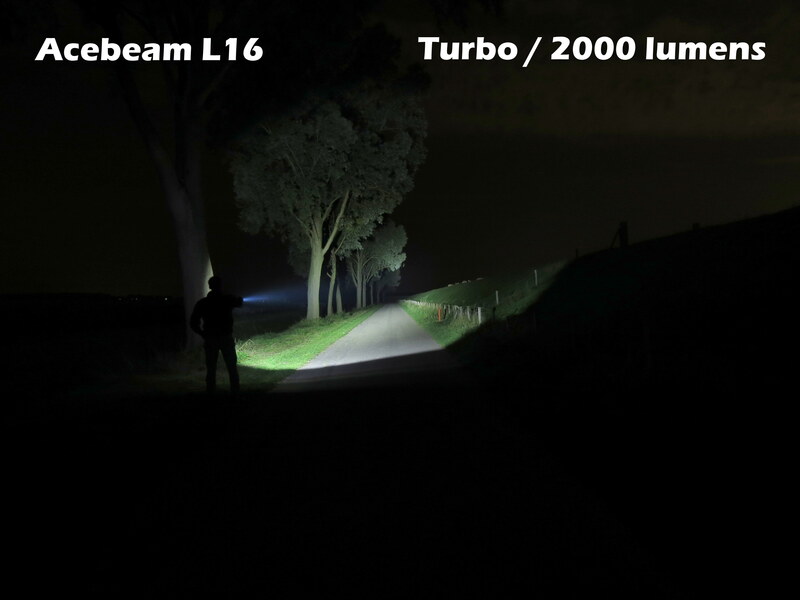 Let’s have a look now how the L16 performs! Starting by projecting the light at a white wall, distance about 1 meter. Closing the indoors’ session by a GIF. 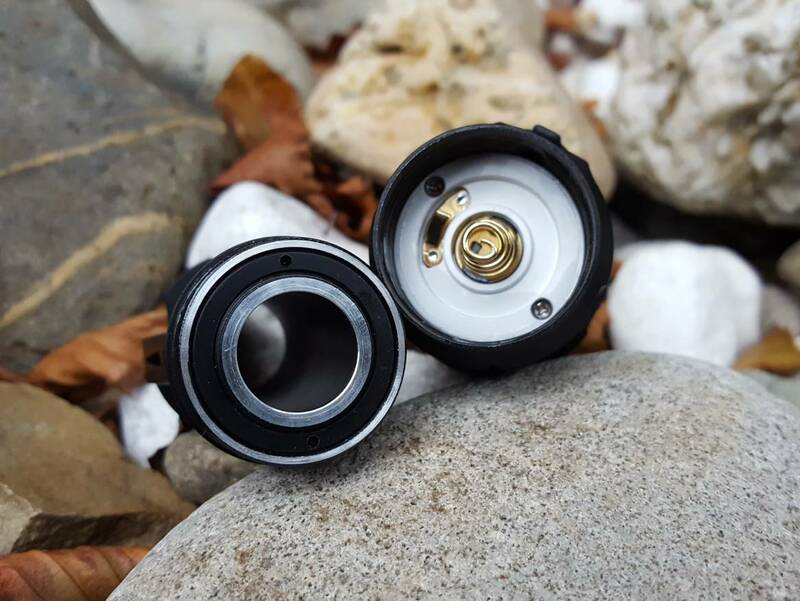 Going outdoors now with the L16! First location is a road, a tree-line and wall at the right. 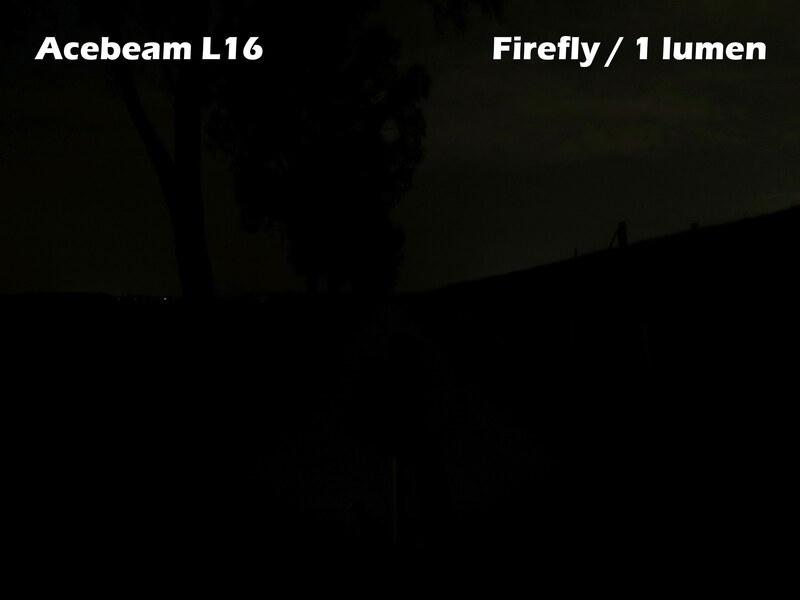 The five output modes shown here, the firefly is barely noticeable. 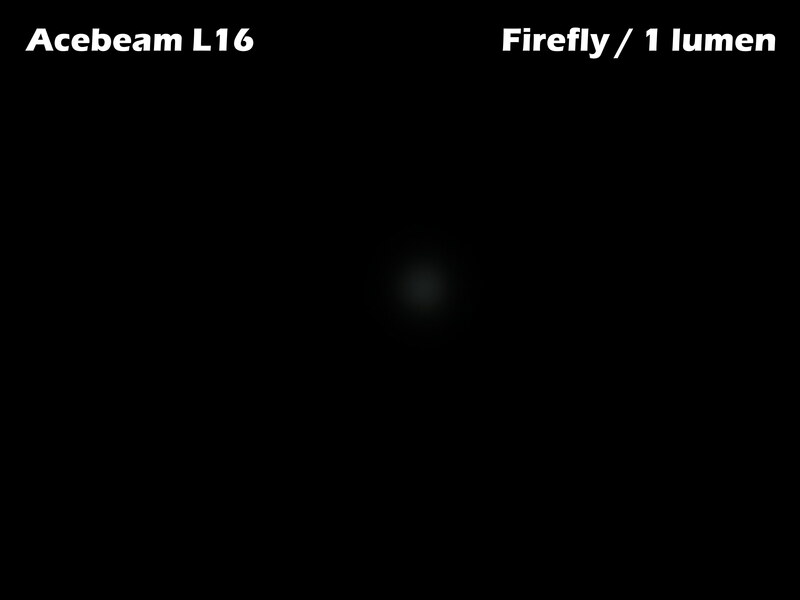 See here that the L16 has good throw, and also an impressive beam. Again some “throw-shots” here at the same location. Time for some shoot-outs now! 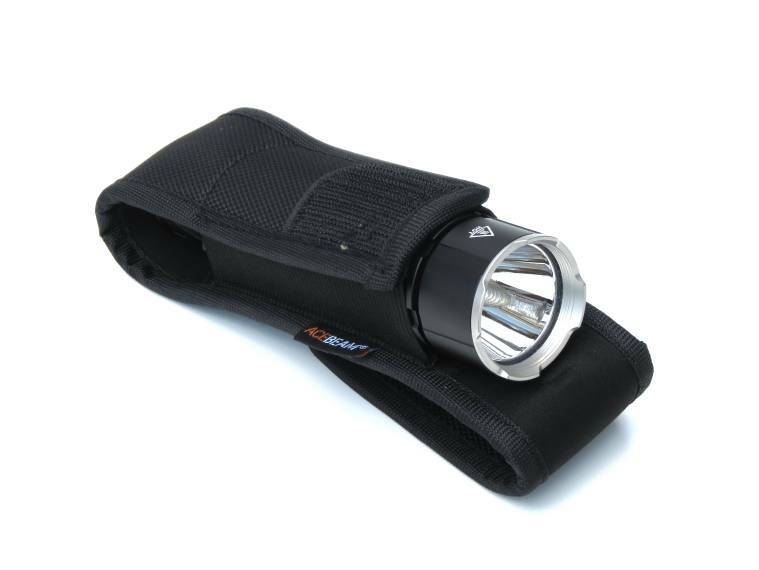 Firstly, we’ll see how the L16 performs against its floody EC50 GEN II-brother, that has an orange-peel reflector, 1000 lumens more and a floody beam. 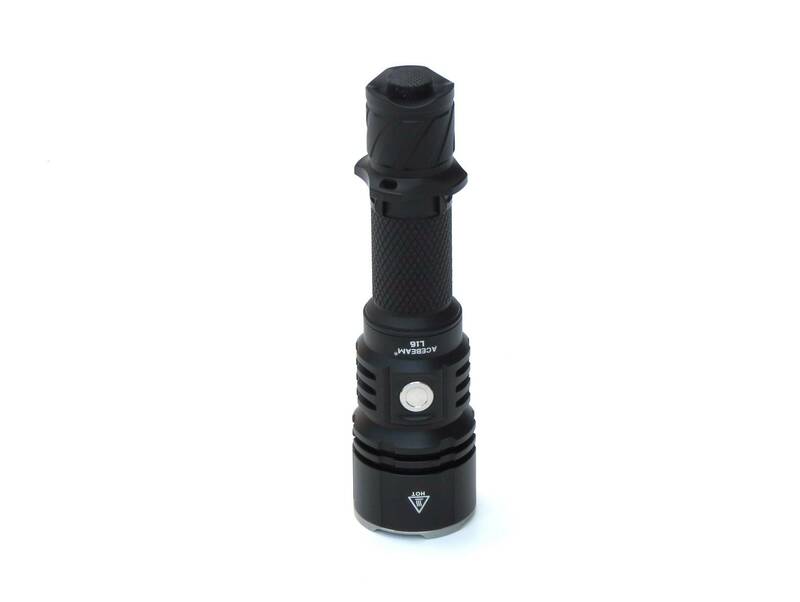 Now, a comparison with the other light that uses a XHP35 HI emitter, the Manker U21. 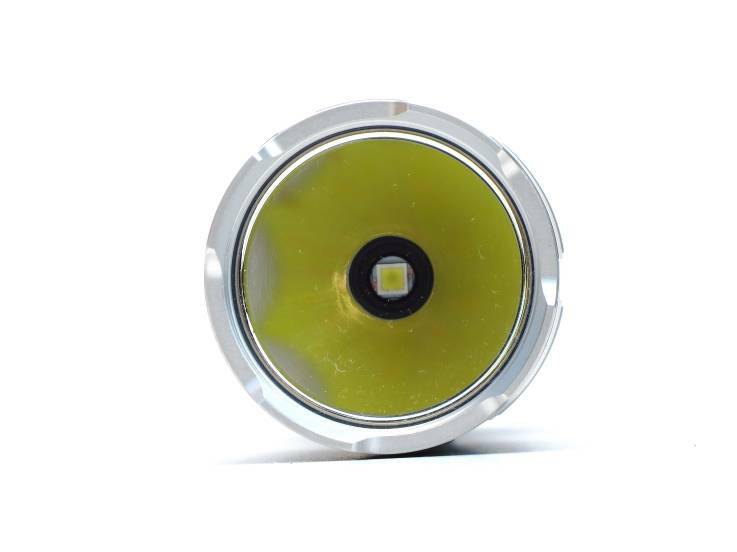 This light has a larger head and deeper reflector, which you can see back in the beam that has some more throw. The U21 is the best thrower here, the L16 does a better job at medium distance. 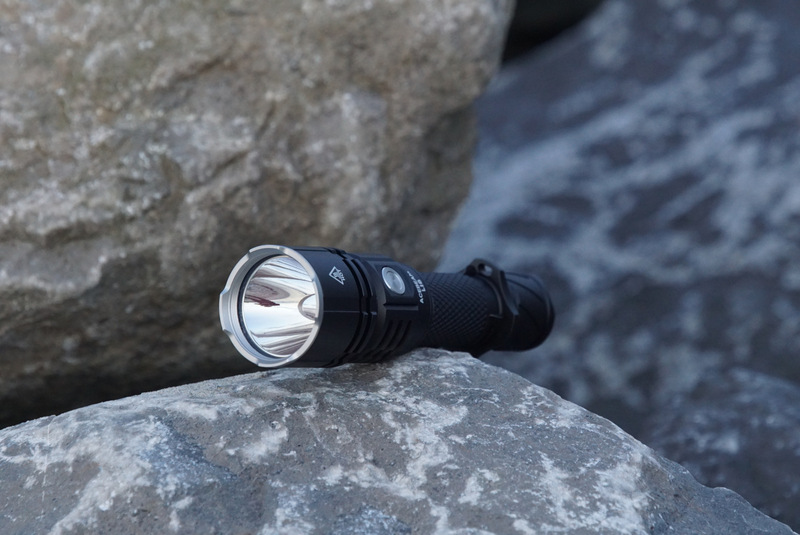 Next light for comparison is the Nitecore P30. Throw is almost equal here, but the L16 has much more output. The second location; a tree at about 200 meters. 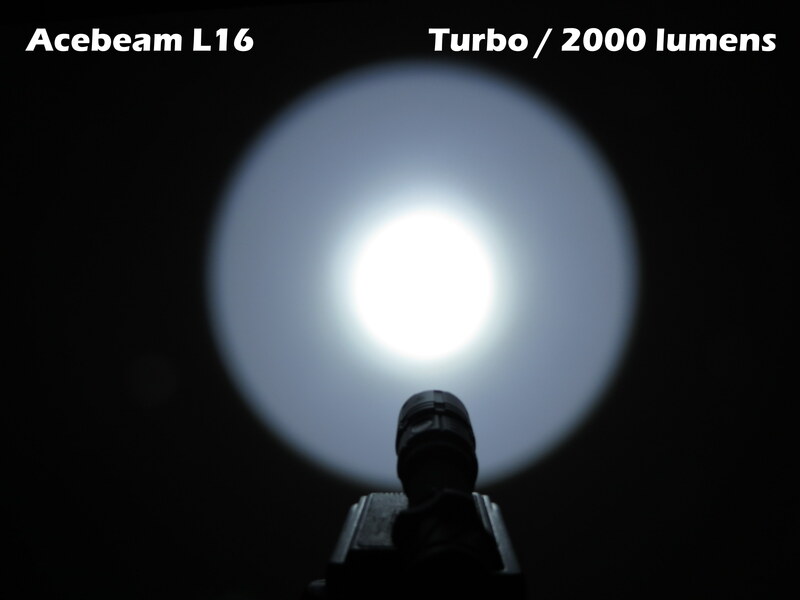 Starting by some standard-pictures featuring the L16. Again against the EC50 GENII. You can see here that the EC50 GEN II clearly misses throw, it can barely reach the tree. And again against the Manker U21; clear to see here that the U21 is the best thrower of the lights we’ve seen in this review. 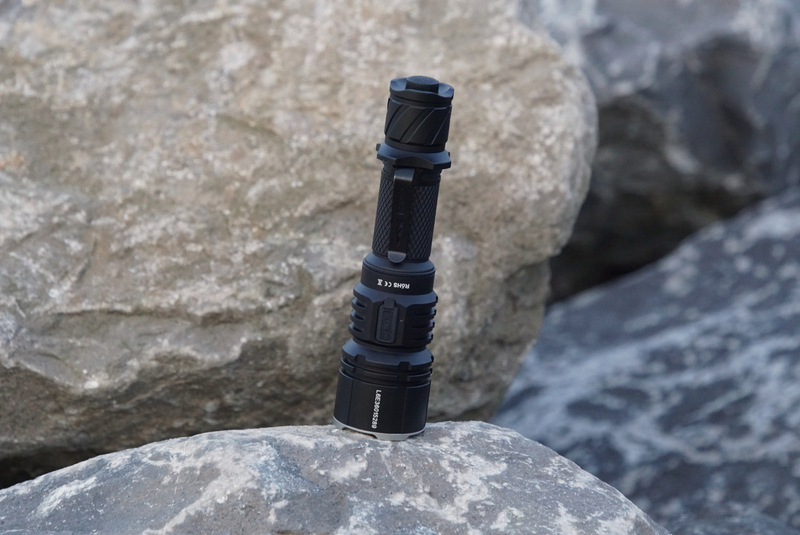 A shootout against the most compact one in this review, the Nitecore P30. 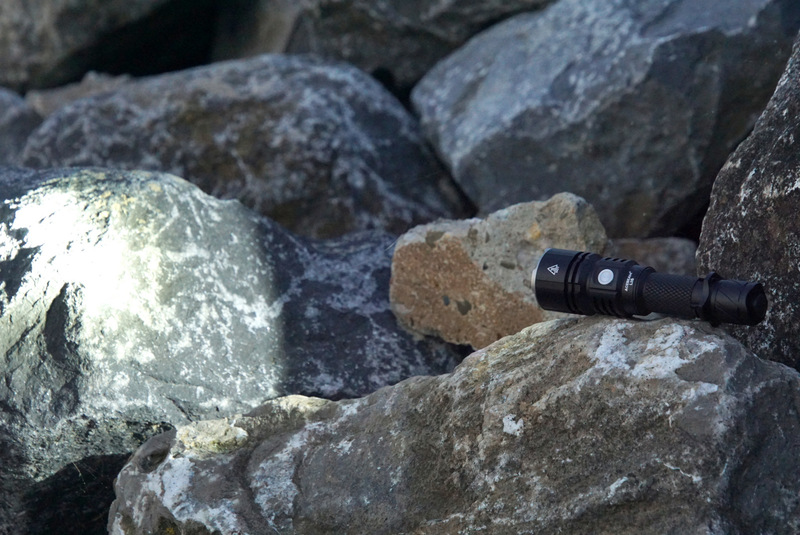 Better throw to the Nitecore, but the L16 lights up the whole tree. I have to say that I like the L16! 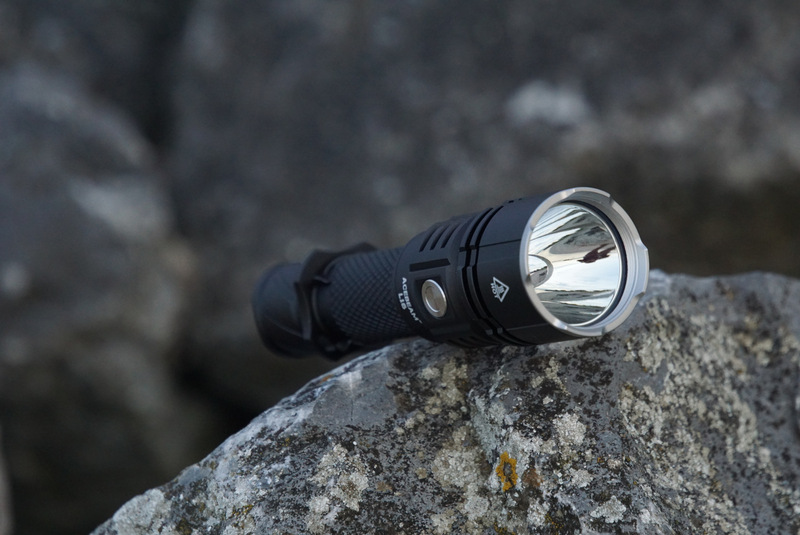 A slightly large light in its class, but well built and finished and easy to work with. 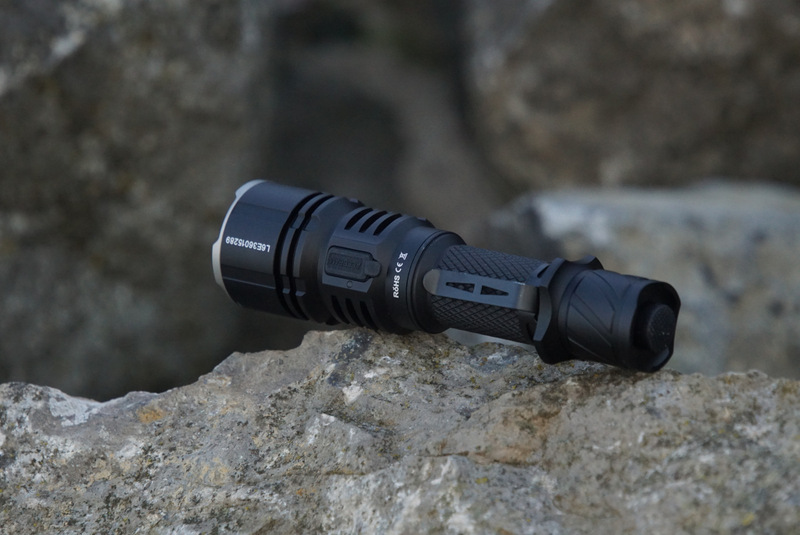 The size is a plus to a tactical light, the interface is very good; charging works fine and the light puts out an impressive and far-reaching beam. It’s not the best thrower, but it has a far reaching broad beam that makes it unique to its size. 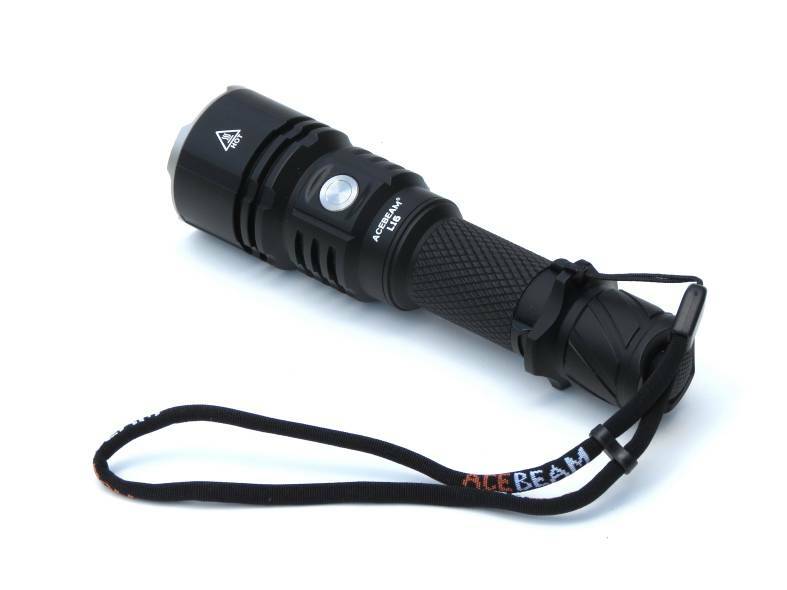 Acebeam should take care at some finishing details and I wish that this light has low-voltage indication. 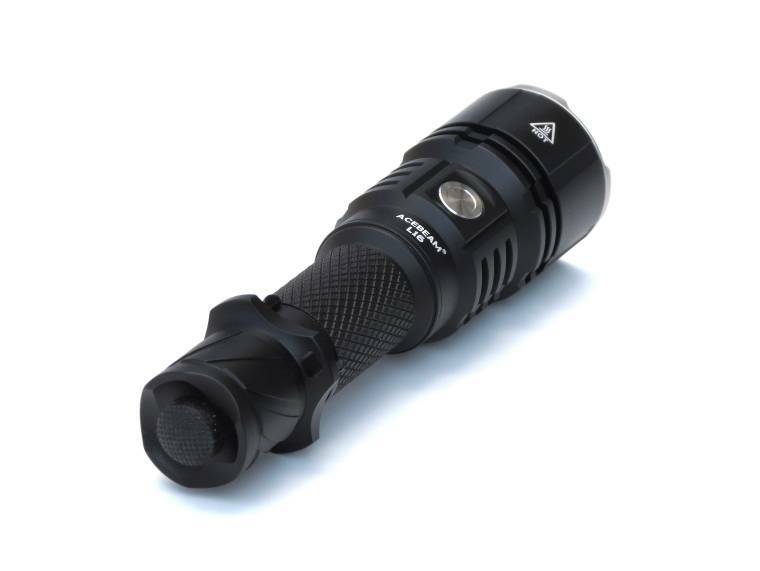 But also to its price (around 80 euro’s), that is not that much, this is flashlight will be a very nice pick for those who need a good tactical flashlight that can be used for daily use too.